This section is no longer being updated. Access the permanent replacement section at http://proximityone.com/cbsa/1/cbsa24660.htm. Please bookmark this new URL. The total population of the Greensboro-High Point, NC MSA metro changed from 725,068 in 2010 to 747,397 in 2015, a change of 27,089 (3.7%). Among all 917 metros, this metro was ranked number 73 in 2010 and 74 in 2015, based on total population. Annual net migration was 2,835 (2011), 3,488 (2012), 2,927 (2013), 4,196 (2014), 4,196 (2015). View annual population estimates and components of change table. See more about population characteristics below. This metro is projected to have a total population in 2020 of 790,980. The projected population change from 2010 to 2020 is 65,940 (9.1%). The population ages 65 years and over is projected to change from 98,343 (2010) to 147,764 (2020), a change of 49,421 (50.3%). See more about population projections. Based on per capita personal income (PCPI), this metro was ranked number 347 in 2008 and 443 in 2014. among the 917 metros for which personal income was estimated.The PCPI changed from $34,745 in 2008 to $37,782 in 2014, a change of $3,037 (8.7%). Per capita personal income (PCPI) is a comprehensive measure of individual economic well-being. Use the interactive table to compare PCPI in this metro to other metros. See more about PCPI in Economic Characteristics section below. 282 metropolitan statistical areas, of the total 381, experienced an increase in real Gross Domestic Product (GDP) between 2009 and 2014. This metro ranked number 67 among the 381 metros based on 2014 GDP. The GDP (millions of current dollars) changed from $33,261 in 2009 to $38,567 in 2014 a change of $5,306 (15.95%). Real GDP (millions of real, inflation adjusted, dollars) changed from $33,261 in 2009 to $35,294 in 2014, a change of $2,033 (6.11%). GDP is the most comprehensive measure of metro economic activity. GDP is the sum of the GDP originating in all industries in the metro. See more about GDP in Economic Characteristics section below. Attributes of driil-down, small area geography within the metro ... metros account for 65,744 of the national scope 73,056 census tracts (others are in non-metro areas). This metro is comprised of 168 tracts covering the metro wall-to-wall. 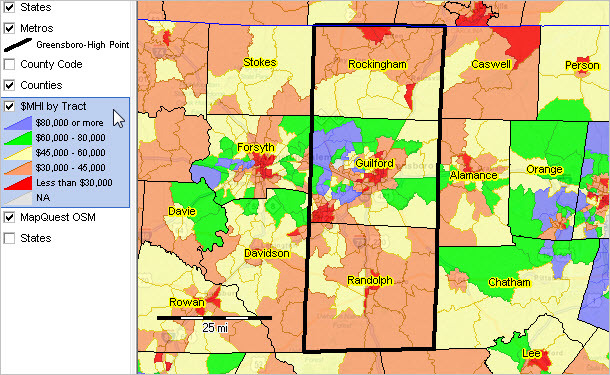 View, rank, compare demographic-economic attributes of these tracts using the interactive tables. Use the CBSA code 24660; see table usage details below the table. Number in this metro: 2. Extended data & analysis in subscription edition.